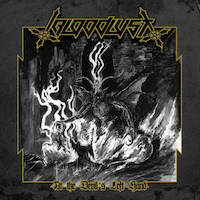 BLOODLUST continue their blackened thrash attack, having taken inspiration from early BATHORY, VENOM, HELLHAMMER and CELTIC FROST. The band aim to denounce God and his angels, to the soundtrack of wailing guitars and bludgeoning, warlike drums. The blackened thrash subgenre seems to be alive and well in 2017, if releases by WEREGOAT and URN are anything to go by. BLOODLUST have stiff competition this year, and the Australians rally with their own spin on the subgenre. In a similar vein to BATHORY, the album begins with an “Intro” – a short, atmospheric track that sets the scene for the music to come. “Deadly Force” opens with tension-building staccato riffs and interesting counter-melodies. Some great drum rolls arrive, and then an unhinged chorus with cleans and guttural vocals coming together in a delightfully demented brew. A lively, trilling solo eddies around the solid rhythm riffs. Muffled, descending riffs conjure up an image of something (or someone) burning on “Witchfyre”. While caustic vocals and layered riffs work things up into a frenzy, melancholy counter-melodies then create an atmosphere of tragedy. The second half of the album has three great tracks in a row in the form of “Freak of the Night”, “Black Hymn to Death” and “Wolves of the Warcursed Earth”. “Freak” starts with great harmonized riffs and a strong bass guitar parts – better run and hide…A sustained growl builds a feeling of fear, while a sizzling guitar solo ramps things up higher. Drum rolls finally bring things to a head, and a fade-in solo creates a feeling of chaos. “Black” begins on a distinctly sinister note, and the vocals are particularly good here. The thrashy section is addictive, the second solo crackles with energy, and the drum rolls are impressive. “Wolves” is a furious number, with a blistering initial solo. The guitar slides and catchy rhythm riffs add to the high energy levels of the track. Things end with a bang with rich bass notes and sizzling riffs. Given what BLOODLUST is up against in their subgenre, I’m impressed with their efforts on “At the Devil’s Left Hand”. The production feels a little too compressed at times, but nonetheless there’s plenty to enjoy on this platter.